Roulette event is still ongoing until March 23rd and the Skin Fair 2016 has officially started today! The body tattoo named "Pinned Up" by Biyo Kozan and the Catwa head applier named "Ella" by Enfer Sombre are both exclusive items from this event. There's a lot of variety that you can find at the skin fair and I am sure you will find something that really suits your taste. 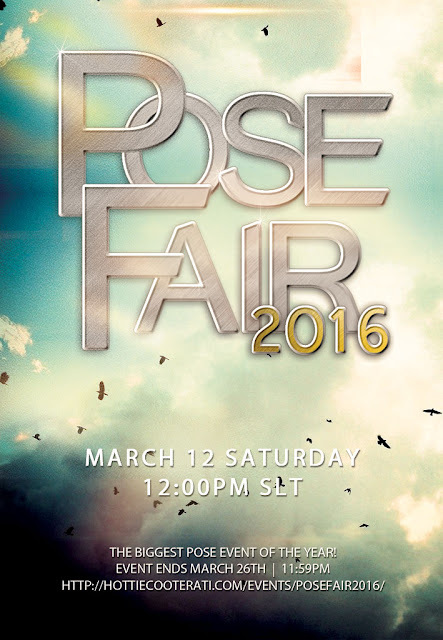 And lastly, the Pose Fair 2016 will open tomorrow March 12th. With my blogger early access pass, I was able to visit the place and "sneak peek" on what our talented SL Pose Makers have in store for you. All I can tell you is that there are lots of nice poses with props and animations that I assure you will all love and enjoy. There are also designers that have put out gifts for this event like the pose I used on the second photo by *bbqq*. For more details of this event, you can visit this website.